* Bucko’s Charity, Stockton Reservoir, Warwickshire. Sat, 33. Fred Bispham (Peg One Angling Centre) 72-3-0, carp, poled pellet; Jake King (Bucko’s) 52-6-0; John Holmes (Bucko’s) 51-13-0; Alan Rose (Bucko’s) 49-6-0. £239 raised. * Garbolino Tunnel Barn Farm, Shrewley, Warks. Sun, 42, House Pools 1 and 2. Pete Rice (Bag’em Matchbaits) 145-6-0, F1s, roach and skimmers, poled caster through groundbait slop at 2m, peg 28 House 2. Mark Johnson (Bait-Tech) 120-1-0; Dave Round (Mansfield Woodhouse Angling) 107-14-0; Les Wetton (Tunnel Barn Farm/F1 Baits) 105-12-0; Paul Bick (Shakespeare) 102-7-0; Nathan Mathews (Rugeley Power) 88-12-0. * Shakespeare Championship Qualifier, Warks Avon, Evesham. Sun, 64. Steve Pierpoint (Sensas WB Clarke) 5-5-0, gudgeon and bleak, 6 & 11m, peg 2; Leigh Gardner (Shakespeare) 5-4-0; Mark Gaylard (Daiwa Gordon League) 5-3-8; Barry Blakemore (Gloucester Angling) 5-1-0; Kevin Millard (Gelnfall AC) 4-15-0. Qualifiers: Steve Pierpoint, Barry Blakemore, Mark Gaylard. * Wychavon Championship Qualifier, Warks Avon, Evesham. Sat, 69. 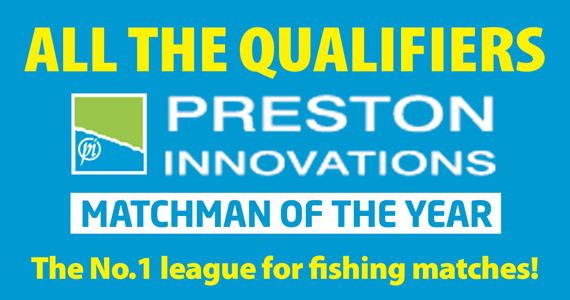 Mark Gaylard (Daiwa Gordon League) 7-0-0, perch, poled worm maggot and caster, peg 1; Ian Sutherland (Land Rover) 6-14-0; Steve Pallett (Sensas WB Clarke) 6-4-0; Tony Marshall (Shakespeare) 6-1-0; James Wilson (Browning Worcester) 5-15-0. Qualifiers: Mark Gaylard, Trevor Chalk, Ian Sutherland. Angling Trust/Canal & River Trust Stillwater Champs qualifier, Boddington Reservoir, Warks. Weds, 49. Frank Hayhurst (Nelson) 52.400, carp, pellet waggler & bomb, peg 87; Eamonn Brennan (Club Skylark) 48.660; Maurice Williams (Sensas Chiltern Baits) 44.900. Beechdale AC, Preston Innovations Boldings. Sun, 15, Chestnut Pool. Andy Sargent (Beechdale) 59-1-0, carp to 4 lb, poled pellet, peg 23; Martin Whittaker (Beechdale) 50-14-0; Nick Appleby (Beechdale) 49-0-0. Bilston Angling Centre, Monkhall Fishery, Monkhopton, Shropshire. Wed, 10, Owl Pool. Steve Lovell (Mosella Bait Tech) 63-15-0, carp to 2 lb, poled pellet, peg 1; Dennis Sumner (Bilston Angling Centre) 45-13-0; Barry Williams (Bilston Angling Centre) 42-14-0. Sun, 10, Staffs-Worcs Canal, Compton. Bert Simmill (Bilston Angling Centre) 6-3-0, perch, roach and skimmers, poled squatt and pinkie, peg 2; John Hall (Bilston Angling Centre) 5-13-0; Dave Pinches (Goldthorn Social) 5-8-6. Buckley Jubilee Cup, Trap Pool, Clwyd, N. Wales. Sun, 20. Rhys Ellis (Buckley Juniors) 25-10-0, roach, bream and ide, maggot feeder to island, peg 33; Mal Griffiths (Buckley) 18-9-0; Graham Davidson (Buckley) 16-7-0. Cardiff Nomads, Hendre Lake. Tues pm, 12. Clive Branson (Sensas Nomads) 17-13-0, roach, waggler and maggots, peg near car park; Clive Roberts (Sensas Nomads) 14-15-0; Mike Towler (Glamorgan Rebels) 14-3-0. Cefn Mably Lakes, Gwent. Wed, 22, over-50s. Mark Guerra (Newport) 56-0-0, carp, poled paste, car park bank; Bob Mitchell (Cefn Mably) 52-2-0; Tony Worgan (Tredegar) 50-1-0; Mike Yandle (Tredegar) 48-0-0. Connah’s Quay, Weston Pools, N. Wales. Sun, 20. Brian Probert (Connah’s Quay) 102-14-0, carp, pole and pellets, Canal Pool peg 46; Winston Duckers (Chester) 79-8-0; Graham Bell (Connah’s Quay) 73-4-0. Elmbridge, Heron Pool, Droitwich, Worcs. Thurs, 18. Jim Russell (Elmbridge) 135-6-0, carp, poled corn, peg 32; Matt Walker (Elmbridge) 132-0-0; Mark Hardman (Mosella/Bait-Tech) 131-0-0. Sat, 22. Andy Danks (Redstone) 156-12-0, carp, poled pellet, peg 35; Craig Arnold (Allen’s Tackle) 138-0-0; Andy Price (Metal Castings) 136-0-0. Sun, 20. Neil Gater (Vine AC) 128-6-0, carp, poled pellet, peg 30; Sid Toroni (Maver Solihull Angling) 124-7-0; Gary Corbett (Maver Solihull Angling) 117-6-0. Furnace Mill, Wyre Forest, Worcestershire. Sat, 12. 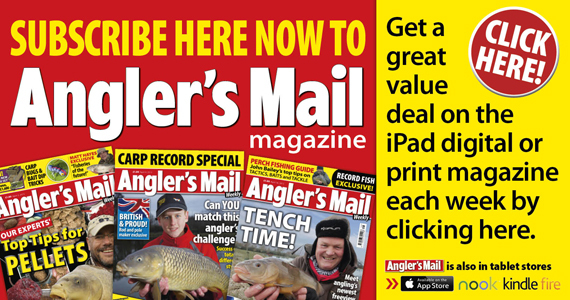 Max Galaszewski (Furnace Mill Fishery) 92-2-0, carp, barbel, F1s, chub, bream and roach, poled worm or pellet over Marukyu EFG 131; Paul Cook (Maver/Mark’s Tackle) 89-14-0; Kevin Williams (Wolverhampton) 74-9-0. Garbolino Tunnel Barn Farm, Shrewley, Warks. Mon, 19, House Pool 2. Graham Young (Young’s MG) 134-6-0, F1s, roach and skimmers, shallow maggot at 2m, peg 35; Chris Constable (Tunnel Barn Farm Veterans) 120-15-0; Malcolm Jones (Banbury Gunsmiths) 120-6-0. Tues, 33, over-50s, Top and Canal Pools. Chris Constable (Tunnel Barn Farm Veterans) 105-15-0, F1s, paste at 2m, peg 29 Top; Ken Turner (Barford) 98-7-0; Dave Chapman (White Hart Coventry) 98-6-0; John Berry (White Hart Coventry) 89-6-0. Wed, 19, House Pool 2. Pete Rice (Bag’em Matchbaits) 152-14-0, F1s, roach and skimmers, poled maggot through slop at 2m, peg 38; Richard Knowles (Shakespeare) 129-10-0; Chris Constable (Tunnel Barn Farm Vets) 126-7-0. Thurs, 68, Veterans, House Pools 1 and 2 & New Pool. Gary Hiley (Tunnel Barn Farm Vets) 138-4-0, F1s, roach and skimmers, banded pellet shallow at 4m, peg 38 House 2; John Berry (White Hart Coventry) 123-13-0; Reg Davies (Tunnel Barn Farm Vets) 108-10-0; Chris Constable (Tunnel Barn Farm Vets) 93-6-0; Dave Purvis (Tunnel Barn Farm Vets) 81-11-0. Fri, 15, Canal Pool. David James (Mosella UK) 138-0-0, F1s, poled caster down edge, peg 6; Pete Rice (Bag’em) 117-15-0; Les Wetton (Tunnel Barn Farm/F1 Baits) 111-14-0; Pete Hancox (Birmingham) 92-10-0. Sat, 19, Club Pool. Pete Rice (Bag’em) 148-14-0, carp, F1s, barbel and stockies, caster through slop at 2m, peg 16; Ronnie Biggs (OHMS) 134-15-0; Jack Harness (Hydrolastic) 130-4-0. Goodyear AC, Greenways Pool, Pattingham, Shropshire. Sun, 15. Steve Gallagher (Goodyear) 66-3-0, carp to 6 lb, tip and pellet, peg 16; John Taylor (Goodyear) 55-2-0; Bob Cook (Goodyear) 52-10-0. Thurs, 13, Staffs-Worcs Canal, Slade Heath. Jamie Edgerton (Wolverhampton AA Van den Eynde) 6-6-0, perch and roach, chopped worm and caster, peg 13; Dave Smith (Bridgtown) 4-8-0; Joe Hewitt (Goodyear AC) 4-6-0. Sun, 15, Willowmarsh Fishery, Shenstone, Worcs.. JJ Gallagher (Goodyear) 107-2-0, carp to 8 lb, poled pellet and sweetcorn, Dragonfly Lake peg 12; Pete Rogers (Goodyear) 93-15-0; Paul ‘Flog It’ Martin (Goodyear) 86-6-0; Steve Gallagher (Goodyear) 77-0-0. Hawkesbury, Bedworth, Warks. Thurs, 12. John Kidd (Hawkesbury) 124-5-0, carp, poled biscuit and meat, peg 28; Richard Grant (Hawkesbury/Gillette) 96-8-0; Graham Nicholls (Hawkesbury) 78-5-0. Sat, 14. James Rock (Army) 88-8-0, mixed, poled meat, maggot and corn, peg 42; John Kidd (Hawkesbury) 72-2-0; Richard Grant (Hawkesbury/Gillette) 68-1-0. Sun, 21. Keith Hudson (Hawkesbury) 106-12-0, carp, method and maggot and corn, peg 42; John Kidd (Hawkesbury) 102-7-0; Stuart Johnson (Hawkesbury) 88-12-0. Holgan Farm, Llawhaden, West Wales. Sun, 20. Ian Heaps (Holgan Farm) 173-2-0, carp, poled pellets in margins and bomb towards island, peg 3; Colin Bates (Haverfordwest) 108-12-0; Keith Moore (Haverfordwest) 88-4-0. Izaak Walton Fishery, Chebsey, Stafford. Wed, 12, Top Pool. John Wild (Stafford) 104-12-0, carp, poled paste; Chris Robson (Bilston Angling Centre) 97-4-0; Steve Edwards (Izaak Walton Fishery) 89-6-0; Ray Young (Izaak Walton fishery) 82-13-0. Sat, 16, Top Pool. Geoff Thomas (Meir and Longton RBL) 77-9-0, carp and silvers, poled pellet; John Wild (Stafford) 74-7-0; Neil Edwards (Meir and Longton RBL) 69-5-0; Dean Lockett (Meir and Longton RBL) 64-7-0. King’s Pools, Shareshill, Staffordshire. Wed, 21, Big Match Pool. Jordon Hall (Maver Midlands/Bag’em) 116-10-0, carp to 6 lb, poled pellet, peg 55; Martin Pritchard (Bilston Angling Centre) 78-11-0; Mel Davies (King’s Pools) 74-9-0. Sun, 10, Carp Pool, 10. Bob Baker (King’s Pools) 130-9-0, carp to 3 lb, poled pellet, peg 1; Jordon Hall (Maver Midlands/Bag’em) 117-6-0; John Benjamin (King’s Pools) 86-12-0. Lydney AC/Forest of Dean AC, Redhill Fishery, Cefn Forest, Monmouth. Sun, 16. Paul Grindle (Lydney) 48-12-0, carp, cage feeder and corn plus poled maggot, Matthew Grindle (Lydney Juniors) 32-14-0; Adrian Davis (Lydney) 26-0-0; Mike Shields (Forest of Dean AC) 24-9-0. Maver Solihull Angling Centre, Molands Mere, Packington Somers, Warks. Wed, 15. Martin Wood (Maver Solihull Angling Centre) 29-4-0, F1’s, poled pellet, peg 14. Ron Taylor (Packington) 11-10-0; Suzi Smith (Kobra) 11-0-0. Monk Hall, Monkhopton, Salop, Sun, 13. Steve Harris (Grant Albutt Angling Supplies) 95-15-0, carp and F1s, poled pellet, peg 2 Lark Pool; Dean Sheldon (Fosters) 52-14-0; Ben Stanford (Monk Hall) 50-14-0. Moorlands Farm, Hartlebury, Worcs. Tues, 28. Ryan Thacker (Moorlands) 175-14-0, carp, shallow meat at 13m, peg 10 Bank Pool; Steve Wright (Miracle Baits) 145-15-0; Iwan Mills (Robins Timber) 129-10-0. Wed, 23, over-50s, Silver Pool. George Reynolds (Colin Pace Angling Academy) 113-9-0, F1s, shallow pellet at 10m, peg 10; Lee Boden (Stonehenge) 97-0-0; Clive Munslow (Moorlands) 91-8-0. Thurs, 35. Pete Truman (Colin Pace Angling Academy) 170-6-0, carp, shallow pellet at 10m, peg 11 Meadow Pool; George Reynolds (Colin Pace Angling Academy) 103-6-0; Dave Bartlett (Colin Pace Angling Academy) 94-12-0. Fri pm, 30. Pete Mace (Autism Birmingham) 172-10-0, carp, poled pellet down edge, peg 26 Bank; Sean Smith (Club 2000) 145-8-0; Roman Skura (Kidderminster Angling) 136-12-0. Sat, 26. Dave Gough (Wolverhampton) 112-14-0, carp, meat at 4m, peg 52 Meadow; Ian Wood (Club 2000) 106-11-0; Mal Watson (Daiwa Gordon League) 71-2-0. Sun, 23. Pete Mace (Autism Birmingham) 93-14-0, carp, poled pellet down edge, peg 48 Meadow; Dave Highfield (Club 2000) 80-2-0; Clive Munslow (Moorlands) 78-14-0. Mosella Manor Farm Leisure, Harvington, Warks. Mon, 10. Steve Ford (Daiwa Gordon League/Old Ghost) 190-2-0, carp and skimmers, poled pellet and pellet waggler, Island Pool peg 16. Steve Beard (Shipston AC) 110-4-0. Wed, 14. Steve Ford (Daiwa Gordon League/Old Ghost) 200-8-0, carp and skimmers, poled pellet, Island peg 12; Chris Telling (Colmic) 186-12-0; Shaun Little (MAP Marukyu) 157-0-0. Thurs, 12. Martin Ludlow (Manor Farm Leisure) 179-0-0, carp and skimmers, poled pellet and bagging waggler, Boundary Pool peg 39; Andy Stone (Arthur’s Angling Supplies) 110-4-0. Sun, 25, Boundary Pool. Rob McKenzie (Gloucester Angling Centre) 70-8-0, carp and skimmers, poled pellet, peg 36; Phil Hardwick (Banbury Gunsmiths) 61-10-0; Chris Telling (Colmic) 51-4-0. Newport, Woodstock Pond, Gwent. Thurs, 14. John Mack (Newport) 51-1-0, carp, poled shallow pellets, peg behind car park; Howard Green (Green’s Tackle) 39-0-0; Martyn Truman (Newport) 32-8-0. Sun, 15, School Pool. Phil Weaver ( Newport ) 101-15-0, carp and bream, poled worm over caster, peg 40 by lily pads; Chris Shepherd (Cwmcelyn) 69-7-0; Howard Green (Green’s Tackle) 66-6-0. Newport Juniors, Woodstock Pond, Gwent. Sat, 14. Morgan James (Newport) 43-7-0, F1s, poled pellets, peg 24 by bailiff’s cabin; Harry Pullen (Newport) 31-8-0; Charlie Dempster (Newport) 27-0-0. NISA, Dynamite Makins, Wolvey, Warks. Wed, 18, Lake 2. Grant Merritt (Hawkesbury) 133-4-0, carp, pellet waggler, peg B19; John Adamson (NISA) 80-0-0; Ben Lockwood (Sensas 04) 75-0-0. Thurs, 26, Avon and Derwent Pools. Mark Melhuish (West Lodge MG) 79-4-0, carp, poled corn to island and down edge, peg 7 Derwent; Lee Westwood (Lichfield) 78-8-0; Terry Cockburn Snr (Coalville) 71-0-0; Andy Searle (Middy) 69-10-0. North Leeds AC, Poole Hall Fishery, Alveley, Salop. Thurs, 10. Brian Smith (North Leeds AC) 199-5-0, carp and bream, poled meat and corn, Heron peg 15; Dave Cox (North Leeds AC) 148-0-0. Fri, 10. Dave Cox (North Leeds AC) 174-5-0, carp and bream, poled meat and corn, Heron 17; John Thornton (North Leeds AC) 152-4-0. Packington Somers, Meriden, Warks. Tues, 12, Gearys Level. John Burchell (Packington) 121-12-0, carp, bomb and pellet, peg 21; Suzi Smith (Kobra) 115-4-0; Phil Canning (Packington) 57-8-0. Sat, 21, Gearys. Lee Richards (Packington) 82-5-0, carp, pellet waggler, peg 10; Jason Shirley (Packington) 79-4-0; Tim Bull (Dynamite Baits) 57-14-0. Sun, 27, Molands Mere. Chris Newton (Smithys) 72-1-0, F1s, poled chopped worm and caster, peg 21, bonus peg £100; John Newton (Smithy’s) 43-2-0; Steve White (Kobra) 39-13-0. Parkes Hall AC, Preston Innovations Boldings, Bridgnorth, Shropshire. Sun, 15, Sycamore Pool. Steve Worton (JMP Tackle) 56-7-0, carp to 3 lb, poled maggot and worm, peg 21; Jamie Round (Parkes Hall) 56-4-0; Jamie Trevis (Parkes Hall) 44-11-0. Poole Hall, Alveley, Salop. Sun, 12. Alan Goode (Stevens Tackle) 61-5-0, carp and bream, poled meat and corn, peg 10; Mick Cook (Poole Hall) 59-12-0; Keith Millard (Tipton) 55-12-0. Preston Innovations Boldings, Bridgnorth, Salop. Mon, 12. Shane Rogers (Oakengates Angling) 166-12-0, carp to 9 lb and bream 3 lb, poled pellet shallow and maggot close in, peg 18 Chestnut Pool; Colin Wozek (Matrix Total Angling) 139-14-0; Josh Humphreys (ABC) 139-13-0. Wed, 12. Tony Foster (Preston Innovations Boldings) 136-0-0, carp to 5 lb, poled pellet shallow, peg 18 Willow; Gareth Emlyn (Oakengates Angling) 86-15-0; Josh Humphreys (ABC) 80-0-0. Thurs, 12. John Wild (Stafford) 128-2-0, carp to 9 lb and barbel 3 lb, poled paste close in, Willow peg 7; Colin Reynolds (Bilston Angling) 127-2-0; Shane Rogers (Oakengates Angling) 112-9-0. Sat, 12. Colin Reynolds (Bilston Angling) 132-6-0, carp to 7 lb and barbel 3 lb, poled pellet and corn down side, Sycamore 13; Mitch Davidson (Colmic) 102-3-0; Tony Foster (Preston Innovations Boldings) 90-0-0. Preston Innovations Woodland View, Hadley, Worcestershire. Tues, 18, Ghost Pool. Chris Senter (Browning West Midlands) 216-0-0, carp to 10 lb, poled maggot, peg 16; Jason Stone (Peg One Woodlands) 69-12-0; John May jr (Peg One Woodlands) 53-14-0; M. Owen (Bilston Angling Centre) 51-8-0. Fri, 19, Ghost Pool. Steve Ford (Daiwa Gordon League) 337-4-0, carp to 15 lb, poled pellet and corn, peg 2; Ray Edmunds (Woodlands) 126-0-0; Lee Cole (Bilston Angling Centre) 95-12-0. Sat, 22, Deans Pool. Phil Edmunds (Peg One Woodlands) 127-8-0, carp to 15 lb, poled pellet down margins, peg 10; N. Hancock (Daiwa Gordon League) 111-12-0; A. Jones (Daiwa Gordon League) 81-0-0; Tony Perry (Woodlands) 64-8-0. Redhill Fishery, Monmouth. Wed, 15, pole-only. Steve Shaw (Marukyu) 159-0-0, carp to double-figures, corn close in, peg 14 Sophie’s Pond; John Hannan (Cwmbran) 133-8-0; Howard Green (Green’s Tackle) 132-0-0. Reedswood AC, Reedswood Pool, Walsall, West Mids. Tues. 9. Phil Watts (Bait-Tech) 57-12-0, carp to 17 lb, poled worm, peg 8; Steve Arnold (Foster’s) 42-14-0; Brian Rigby (Shakespeare) and Dave Webb (Allen’s Tackle Leamore) both 34-4-0. Rhymney, Redhill Fishery, Monmouth. Sun, 18. Lloyd Davies (Rhymney) 86-8-0, carp, poled pellets, Sophie’s Pond; Keith Matthews (Ross) 73-6-0; Ian Jones (Fochriw) 68-0-0. Sirhowy, Redhill Fishery, Monmouth. Sun, 22. Luke Sorokin (Swansea ) 94-12-0, carp to 8 lb, poled pellets in margins, Penny’s Pond; Nigel Morris (Neath) 80-8-0; Alan Davies (Trealaw) 79-8-0; Phil Rawlings (Newport) 70-8-0. Spencer Works, Staunton Court, Gloucs. Sat, 20. Phil Rawlings (Newport) 144-0-0, carp to double-figures, poled casters in margins, bin peg; Phil Weaver (Newport) 135-12-0; Rob Dyer (Swansea) 123-0-0. Stirrup Cup, Birmingham-Fazeley Canal, Curdworth, Birmingham. Sun, 12. Paul Jones (Bilston Angling Centre) 3-15-8, a 1 lb 8 oz skimmer plus bits, poled squatt and pinkie, peg 75; Clark Taylor (Stirrup Cup) 2-15-0; Graham Mason (Dams and Lock) 2-12-8; Sam Lewis (Three Ems) 2-10-8. Wassell Grove, Hagley, Stourbridge, West Midlands. Sat, 16, Brook Pool. Dave Johnson (Club 2000) 90-12-0, carp to 6 lb, poled pellet, peg 22; Chris Bills (Wassell Grove) 86-12-0; Terry Homer (Club 2000) 75-0-0; Sam Parker (Club 2000) 59-8-0. Welsh Civil Service Championship, Dyffryn Springs, Cardiff. Sun, 15. Derek Goode (Pontypridd) 42-0-0, carp, bomb and pellet to island, car park side of Goldsland Lake; Steve Price (Beddau) 36-8-0; Richard Hagg (Cardiff) 32-0-0. West Midlands Fencing, Carney Pools, Welseley Bridge, Stafford. Sat, 20. Jordon Hall (Maver Midlands/Bag’em) 103-9-0, carp to 5 lb, poled pellet, peg 5; Gary Hill (Allen’s Tackle, Leamore) 53-11-0; Lee Dodd (West Midlands Fencing) 53-9-0. White Springs Charity Open, Pontarddulais. Sun, 15. Alan Godrich (Swansea) 85-3-0, carp, poled pellets to island, peg on New Canal; John Smith (Swansea) 78-8-0; Lew Spinks (Swansea) 61-5-0. Wolverhampton AA, Staffs-Worcs Canal, Awbridge, Wolverhampton. Wed, 18. Alan Jordan (Bilston Angling Centre) 19-7-0, chub to 3 lb, poled maggot, peg 1; Arthur Shaw (Wolverhampton AA Van den Eynde( 13-3-0; Jez Meredith (Rough Hay AC) 8-4-0. Wolverhampton Over-60s Club, Staffs-Worcs Canal, Ball Lane, Coven, Staffs. Wed, 25. Dave Smith (Bridgtown) 13-11-0, chub and bream, poled caster; Bert Simmill (Bilston Angling Centre) 9-1-0; Alan Round (Browning Lifestyle) 5-10-0.